“Egyptomania” is a term applied to a surge in Western interest in ancient Egypt, which manifests itself in European and North American art and culture with a variety of Egypt-inspired motifs. It was first seen in the nineteenth century during Napoleon’s invasion of Egypt, and reappeared in the twentieth century when, in 1922, English archeologist David Carter uncovered King Tutankhamen’s tomb. While the 19th century interest in Egypt spread through the production of printed material, such as Dominque-Vivant Denon’s Voyages dans la basse et l’haute de Egypte, the twentieth-century resurgence propagated in part because of the modern media, which created an international sensation. Eventually, twentieth-century Egyptomania infiltrated the everyday life of the western population in a variety of manners, such as Egyptian-inspired jewelry designs, furniture, plays, and even travel to Egypt. 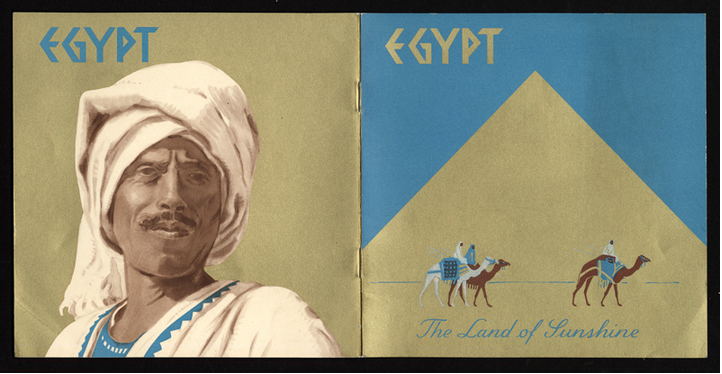 This final trend is exemplified by these travel brochures and postcards, which date from the 1920s and 30s. The destinations of these cruise ships cover nearly the entire globe, however there is surge of brochures advertising cruises to Egypt and the Middle East in the 1920s and 1930s, which can be connected directly to the Egyptomania craze. Luxury cruise to the romantic borderlands of the Mediterranean: Palestine, Egypt: S.S. Statendam : leaving New York February 9th, 1933, Holland America Line, Commandat-Roth Co. Inc. The idea of traveling to the source of Egyptomania, a luxury, that was not available to a large portion of the nineteenth-century Americans and Europeans, became a more viable option to the twentieth-century western elite. This was greatly due to the development of the cruise ship. 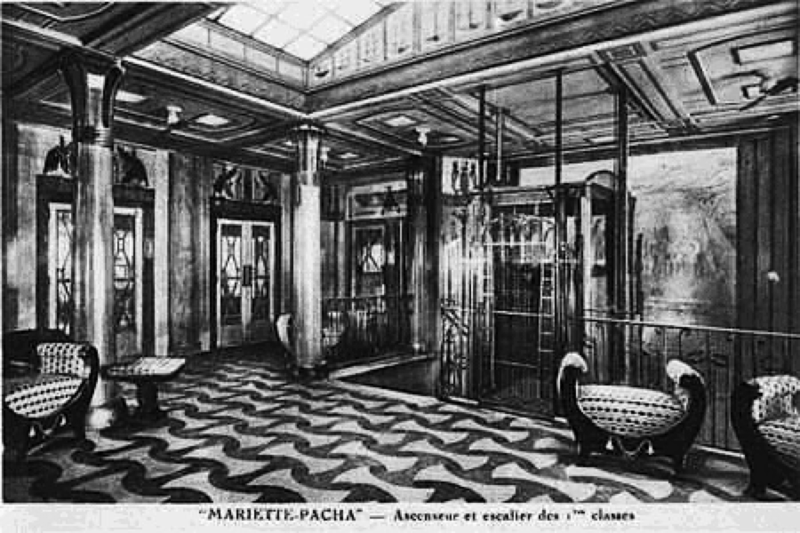 Cruising became popular among the wealthy in years following World War I, allowing the privileged to travel world with great ease. These ships became more appealing throughout the 1920s as ships grew in size and their decoration became more elaborate. And thus, with the concurrent rise of the cruise ship and Egyptomania, the wealthy were able to go right to the source of contemporary popular culture. However, while Egypt acted as important artistic and decorative influence in Europe and the United States, the West, as Edward Said argues in his discussion of Orientalism, nevertheless continued to interpret the East through a constructed lens, even when on location. This is clearly seen in the ephemeras’ depictions of Egypt. Illustrated by European and American artists, these stylized, geometric, graphic illustrations are representative of the all-pervasive Western Art Deco style. Like the faux hieroglyphics and scenes of Egypt drawn by Frenchman Vivant Denon in the nineteenth century, which depicted Napoleon’s Sevrès porcelain desert service, it is arguable that these illustrators are selling the East through a more palatable Western representation. This western lens applied to the Middle East did not appear to be altered even when westerners arrived in Egypt. 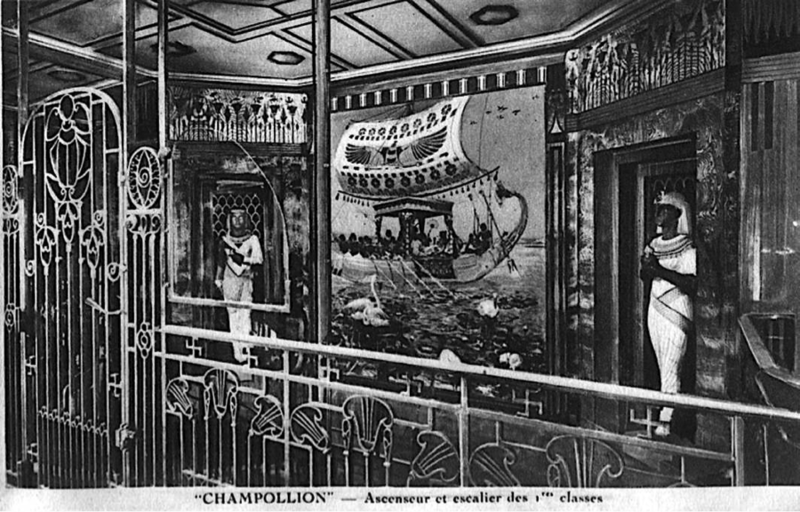 For, not only were the cruise ship brochures, menus, and interiors, decorated in the Art Deco style, but so were the less ephemeral parts of Egypt, such as the buildings. For, the rise of the Egyptian aesthetic in the west lead to an influx of Western visitors to Egypt, which consequently led to the rise of the Western aesthetic in Egypt. This is seen in several Art Deco style buildings and decorated café interiors, predominantly in the city of Alexandria, such as the extent Hotel Cecil. Thus, the West not only experienced a western interpretation of Egyptian culture through the Egyptomania objects created by western designers at home, but even on location in Egypt. Thus, one might conclude that twentieth century Egyptomania was more about the West’s interests and modern style than it ever was about true Egyptian art and culture.